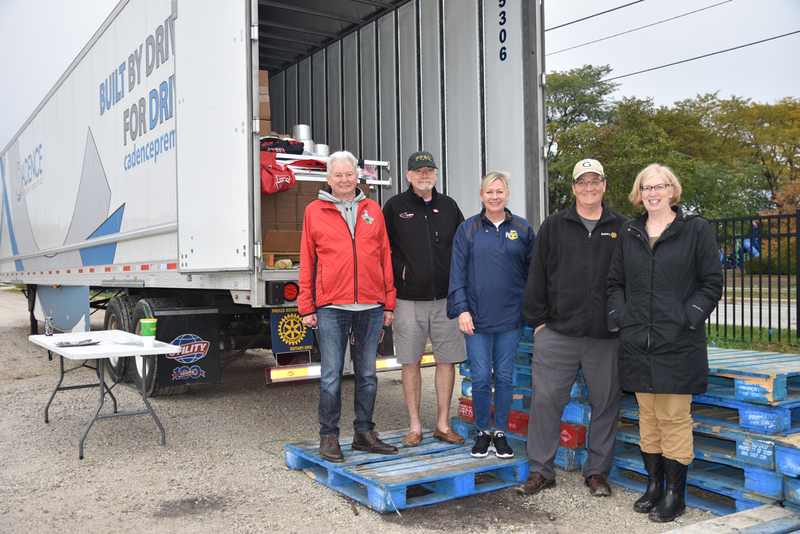 Thanks to volunteers as well as generous donors who rallied for the Hurricane Florence Relief Effort hosted by Rotary Clubs of Naperville and the Rotary Club of Hinsdale, all in Rotary District 6450! Note! Most recent photos are the end of a campaign to collect supplies for folks in Lumberton, North Carolina. Scroll down this page to the beginning of this initiative intended to benefit all ages. Also find a list of special gratitude at the bottom of this post. November 27, 2018 / Mission Accomplished. Donations Arrived! 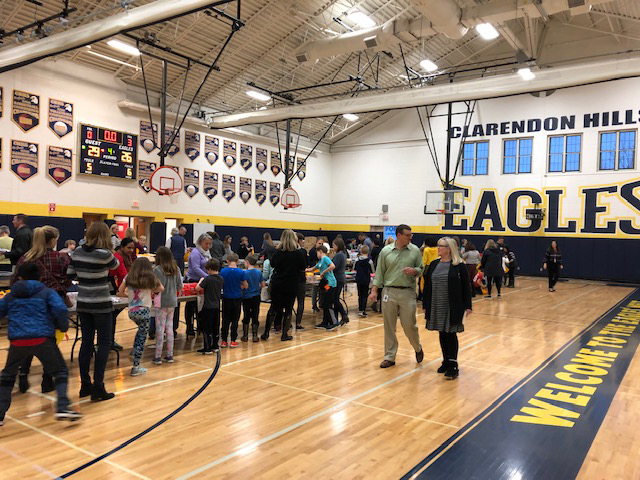 Another member of the Cadence Premier Logistics team pulled into the loading dock in Lumberton with 1,000 “Rotary yellow” back packs filled with school supplies collected and assembled by students in Clarendon HIlls with coordination by the Rotary Club of Hinsdale, Illinois. Rotarian Tom Carter Norton from the Hinsdale Rotary wrote, “Just got a call from the Robeson County School District administrator handling receipt of the school bags. Everything has arrived safely. 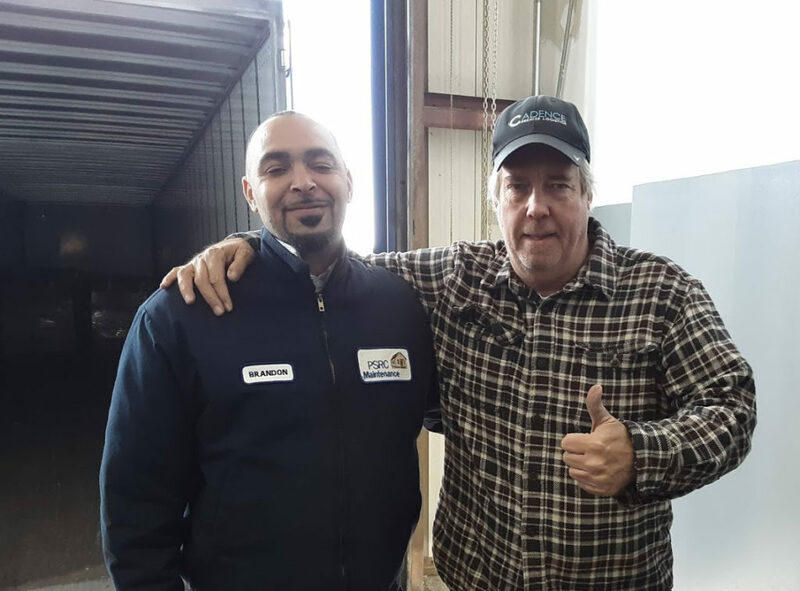 They were especially impressed by the professionalism of the Cadence Premier Logistics driver. “And great news! About 250 of the bags will be handed out at a school parent’s night—-this evening…With another 120 going to a District special needs school tomorrow. All good! Part II! 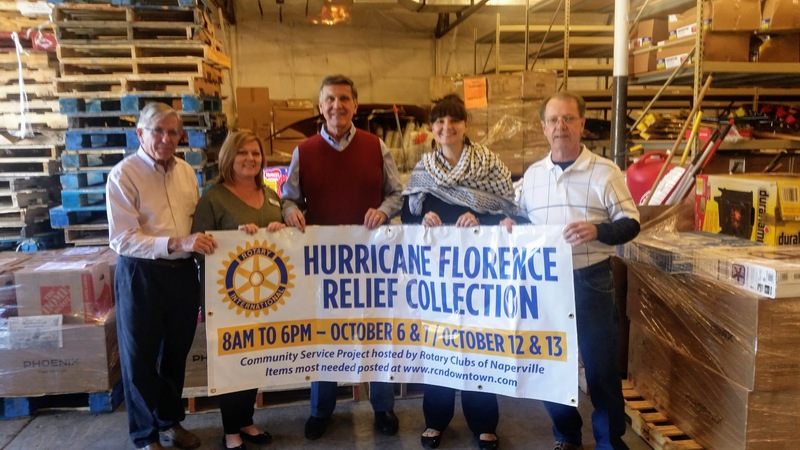 The project for Hurricane Florence Relief continues in Clarendon Hills organized by the Rotary Club of Hinsdale with connections to Rotary Clubs of Naperville and District 6450. November 15 / Rotary Club of Hinsdale Collection of School Items for Hurricane Florence Relief in Lumberton, NC. 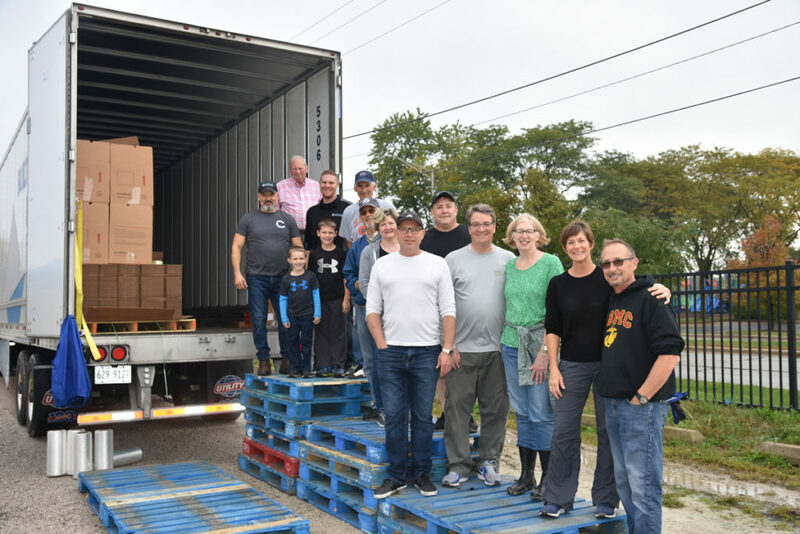 Transport of items was coordinated by Cadence Premier Logistics with the help of 4:44 Rotarians Chuck Corrigan and Rocky Caylor and the Illinois Trucking Foundation. The items are expected to arrive in Lumberton by Thanksgiving weekend or shortly thereafter. As Chuck noted at the Rotary meeting on Nov. 14, Rotary Clubs again have come together to assist Lumberton. 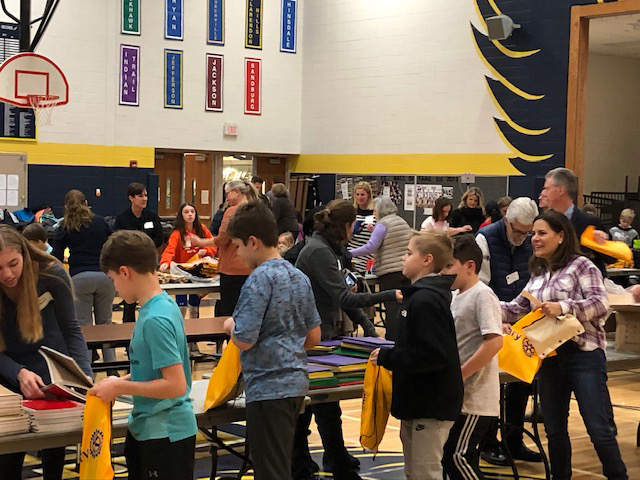 Rotary Club of Naperville/Rotary Charities provided a grant to help underwrite cost of school supplies for 1,000 packs headed for students in Lumberton. At 2PM Wed., Oct. 24, the full trailer was opened again in Lumberton, NC, so folks there could unload 18 pallets of new items. 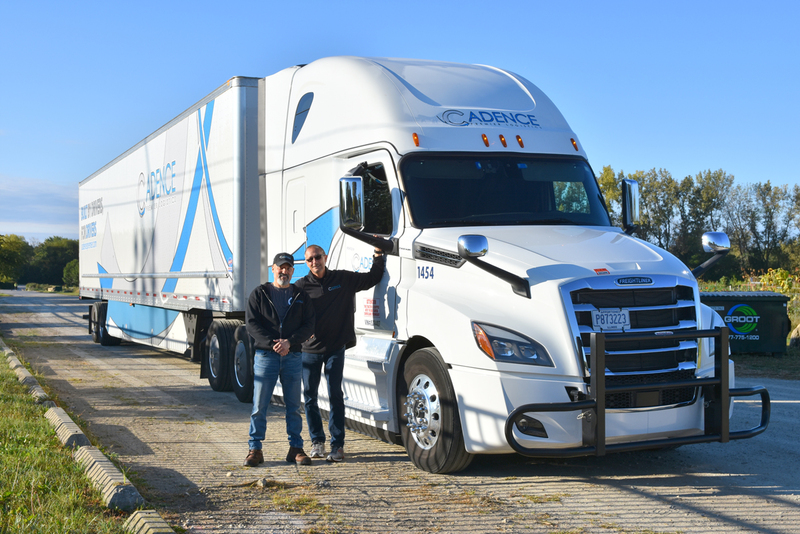 On Oct. 23, The Cadence Premier Logistics Team—Jason Esser, Russell Deneen and Scott Cedar— prepared to close up the trailer with 30,000 pounds of relief supplies donated from the Naperville community. Collection hours at the Garden Plots on West Street and doors to the 53-ft. trailer closed at 6PM Sat., Oct. 13, 2018. 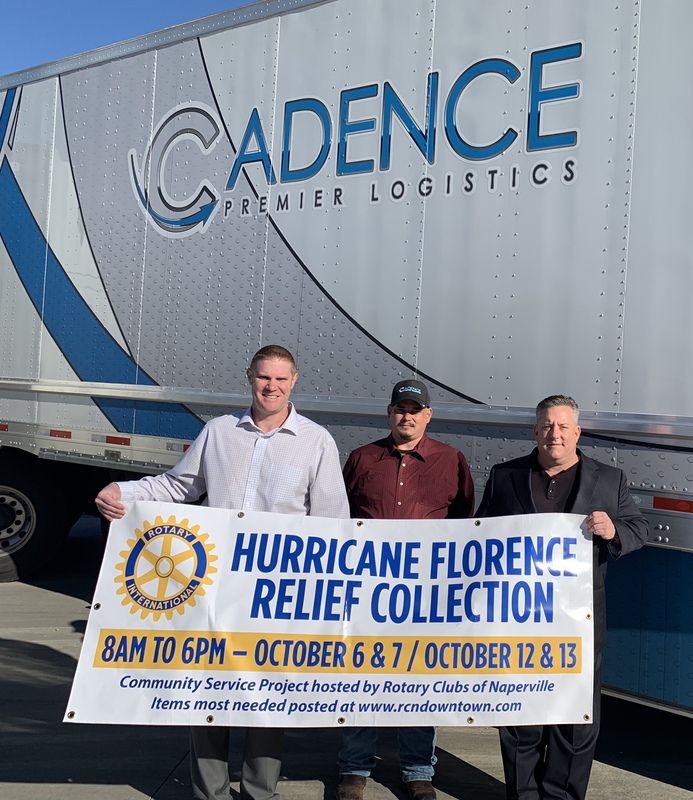 UPDATE, Oct. 13 / The entire community was welcomed to help fill a trailer provided by Cadence Premier Logistics with much needed items to send to Lumberton, North Carolina. 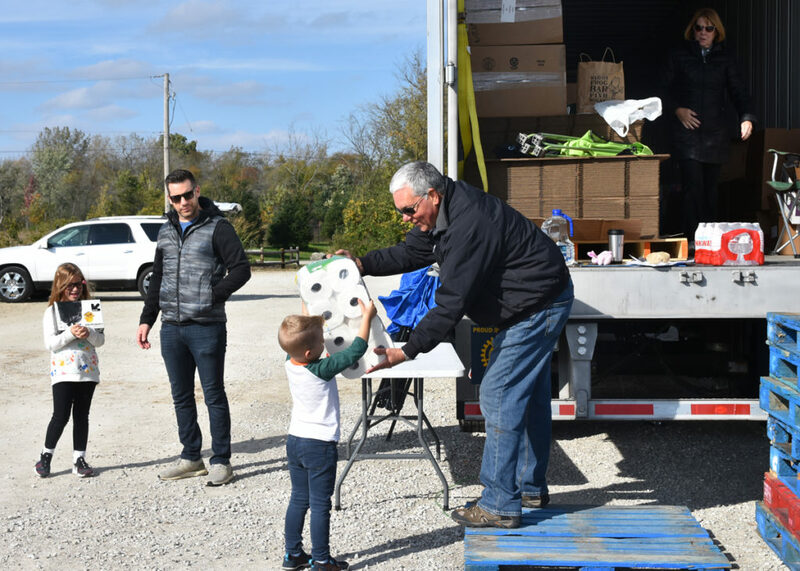 Rotary Clubs of Naperville invited all service clubs, faith organizations, homeowners associations, businesses and individuals to join a community-wide service project by donating items for victims of devastation caused by Hurricane Florence. Items collected will go to Lumberton, NC, one of the cities in economic distress and ravaged by flooding. Fuel is being provided by the Illinois Trucking Association. After donations placed in large Gaylord cartons on pallets are inspected and repacked for balance at the Cadence warehouse in Joliet, the trailer will head to Lumberton mid-week where they will be received by the Rotary Club of Lumberton for distribution to individuals and families in need. Again, many thanks to all for donating the new items requested on the long list. Though clothing and footwear were not requested, it’s likely the donation of 100 pairs of new flip flops, all sizes, will come in handy for folks staying at shelters. All the gently-used tools and ladders also are appreciated. Stay tuned for updates. 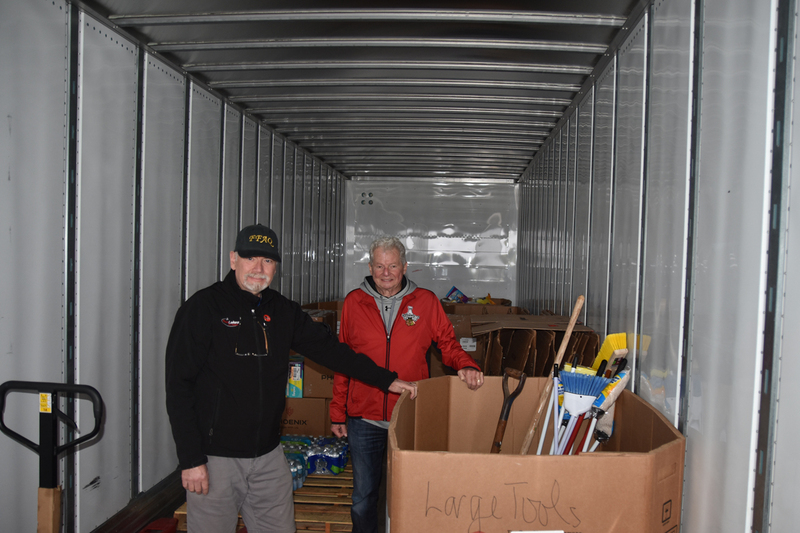 UPDATE, Oct. 8 / Monday morning, organizers from the Rotary Clubs of Naperville contacted the team in North Carolina that will receive the trailer of supplies, asking for an update regarding what’s needed most. 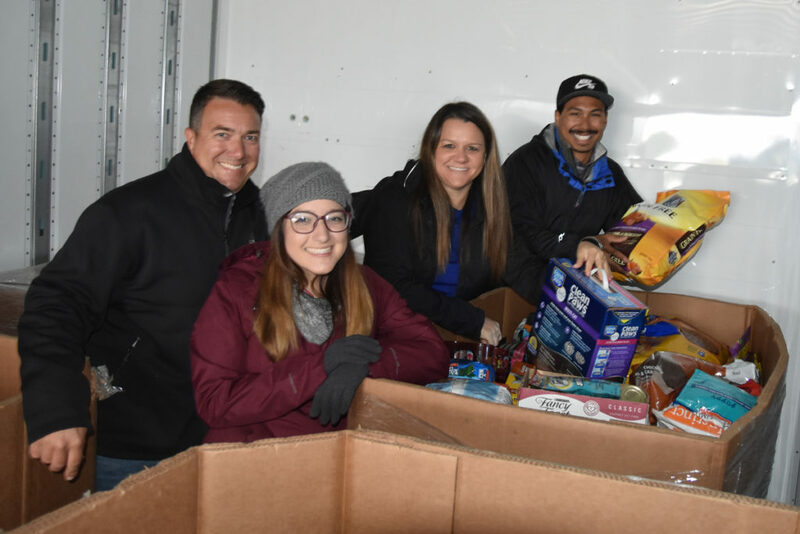 Weekend One – Oct. 6 & 7 / Despite the threat of rain, volunteers were busy unloading vehicles with donations from generous residents for the better parts of the weekend. Pet food was the donation of choice. At the moment, two “Gaylord” boxes are filled to the brim with dog food, cat food and other pet supplies. Throughout the spacious trailer, “Gaylord Boxes” (double wall containers that are 48 x 40 x 36″) now are labeled by category in order to collect, then to transfer bulk product safely when shrink wrapped and placed on a skid. Rotary Clubs in North Carolina will accept the trailer later in October. Again, thanks to all who stopped by with donations and to dozens of volunteers, including members of the Naperville Noon Lions Club, who filled the shifts. Please note: Gently-used hand tools and ladders in good condition are OK. Thanks. 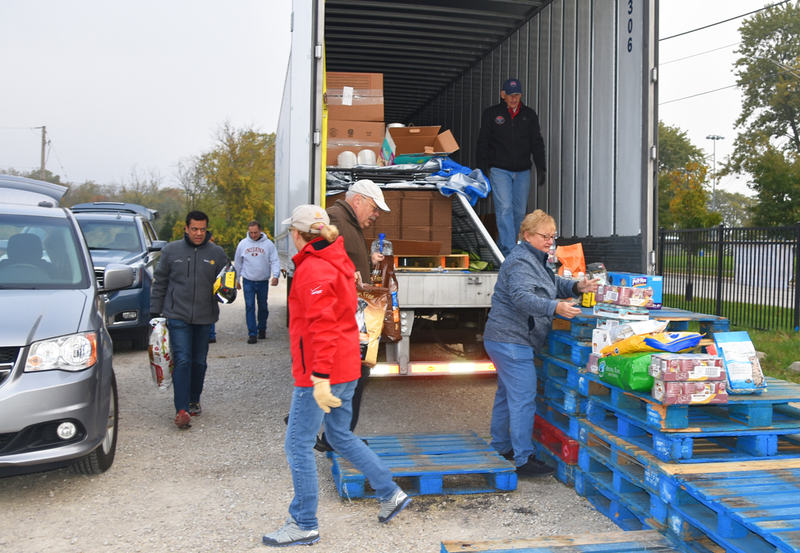 From the first shift on Oct. 6 (pictured above) to the last shifts (pictured below) on Oct. 7, volunteers helped fill 2-hour shifts and the trailer until time to close the doors. At the end of the first weekend, the 53-ft. trailer was about one/third full of new items. Packaging and boxing the donations were made possible with packing supplies provided by Phoenix Closures, Bedford Motor Transport and know-how from the Cadence family team. The one constant throughout the collection hours was the generosity of the donations. Again, many thanks! Dry Run! Driver Trainer Ray Tirado and Rotarian Rocky Caylor stopped by the Garden Plots early Sept. 29 with a large tractor/trailer where Rotary Clubs of Naperville will host a community-wide collection to benefit Hurricane Florence Relief. Stay tuned for updates. Thank you. Thanks to Rotarian Kristy Sullivan of Rotary After Dark for coordinating volunteer opportunities. Sign Up Today to Help Oct. 12 and/or 13! Thanks. Or just stop by to see if help is needed. Calling all volunteers! Sign up for a 2-hour shift via the Sign Up Genius by clicking here. Suggested nonperishable items needed for collection / New items only / ***Indicates Most Needed / Thanks. With Gratitude & Special Recognition for Contributions to this 2018 Community Service Project! Naperville Garden Plot Collection Site Volunteers – Thanks to these organizations for sending folks to fill shifts at the trailer! Naperville Community, thank you again for your donations and support!